If you are looking for a ‘One of Kind’ Ring for that someone special, this is it. 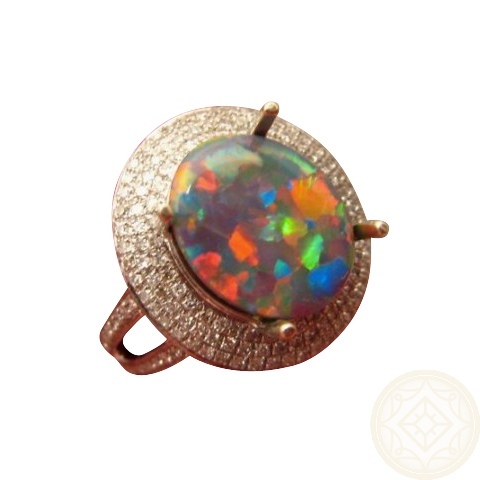 A Rare Natural Red on Black Australian Flagstone Harlequin Opal and Diamond Ring. 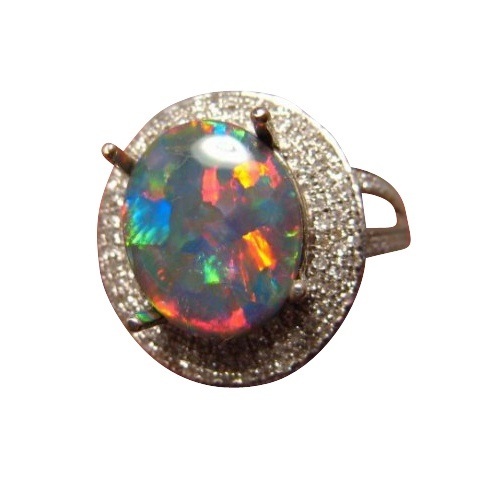 Solid 14k Gold Ring with 3 Rows of Quality Round Brilliant Cut Diamonds in a Halo style at the top going down ¾ of the way down the split band and prong set with one Natural Lightning Ridge Black Opal. Spectacular Dress Ring or Engagement Ring. Ready to ship as advertised or will take 14-21 days for a different Ring Size and Gold Color preference. This ring is ready to ship as advertised or can be ordered in your Ring Size with your Gold Preference. Prongs will be set once Ring Size and Gold Preference is advised. If you would like this setting in 18k Gold or Platinum, please contact for pricing. This is a one and only ring and cannot be made to order. You have one opportunity only to own this very special piece.